Now you can have quick, easy, and professional quality hair cuts right from your own home with the Air Cutter. 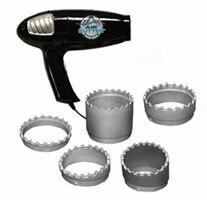 The Air Cutter is fool-proof and allows anyone to give professional quality hair cuts without any mistakes. The powerful vacuum action and precision cutting blades of the Air Cutter stores the cut hair inside so there’s no mess. It is simple and easy to use. You first just find the attachment to cut the amount of hair you want. Then you just connect it to the air cutter and go up and down over the area you want cut. It’s that easy. With the Even Cut technology in the Air Cutter, is it virtually impossible to make a mistake. It works on all hair types. The average family spends over $1,200 a year on haircuts but you can save that with the Air Cutter. It pays for itself within the first couple of hair cuts. The Air Cutter comes with 5 attachments and a free styling guide. It costs just 2 easy payments of $29.95 but right now there is a free trial offer available where you can try it first for 30 days by just paying the shipping and handling cost of $14.95. One Comment on "Air Cutter"
this product is it possible to come in greece if i order it ?? ?